The income statement, or profit and loss statement (P&L), reports a company’s revenue, expenses, and net income over a period of time. The “bottom line” of an income statement is the net income that is calculated after subtracting the expenses from revenue. It is important to investors – also on a per share basis (as earnings per share, EPS) – as it represents the profit for the accounting period attributable to the shareholders. The income statement is a financial statement that is used to help determine the past financial performance of the enterprise, predict future performance, and assess the capability of generating future cash flows. It is also known as the profit and loss statement (P&L), statement of operations, or statement of earnings. The income statement consists of revenues (money received from the sale of products and services, before expenses are taken out, also known as the “top line”) and expenses, along with the resulting net income or loss over a period of time due to earning activities. Net income (the “bottom line”) is the result after all revenues and expenses have been accounted for. The income statement reflects a company’s performance over a period of time. This is in contrast to the balance sheet, which represents a single moment in time. The “bottom line” of an income statement—often, literally the last line of the statement—is the net income that is calculated after subtracting the expenses from revenue. It is important to investors as it represents the profit for the year attributable to the shareholders. For companies with shareholders, earnings per share (EPS) are also an important metric and are required to be disclosed on the income statement. matching principle: According to the principle, expenses are recognized when obligations are (1) incurred (usually when goods are transferred or services rendered, e.g. sold), and (2) offset against recognized revenues, which were generated from those expenses, no matter when cash is paid out. In cash accounting—in contrast—expenses are recognized when cash is paid out. FIFO: Method for for accounting for inventories. FIFO stands for first-in, first-out, and assumes that the oldest inventory items are recorded as sold first. LIFO: Method for accounting for inventory. LIFO stands for last-in, first-out, and assumes that the most recently produced items are recorded as sold first. 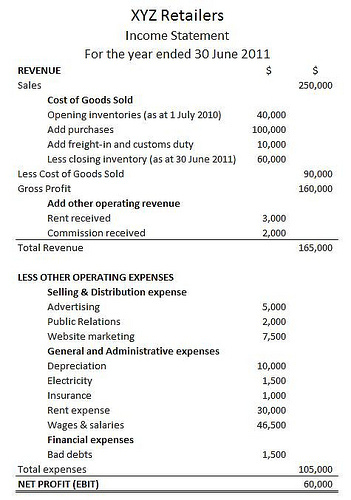 Income statement: Accounting for inventory can be done in different ways, leading to differences in statements. GAAP’s assumptions, principles, and constraints can affect income statements through temporary (timing) and permanent differences. Also there are events, usually one-time events, which create “permanent differences,” such as GAAP recognizing as an expense an item that the IRS will not allow to be deducted. deferred: Of or pertaining to a value that is not realized until a future date, e.g. annuities, charges, taxes, income, either as an asset or liability. fair market value: An estimate of the market value of a property, based on what a knowledgeable, willing, and unpressured buyer would probably pay to a knowledgeable, willing, and unpressured seller in the market. An estimate of fair market value may be founded either on precedent or extrapolation but is subjective. Fair market value differs from other ways of determining value, such as intrinsic and imposed value. Although most of the information on a company’s income tax return comes from the income statement, there often is a difference between pretax income and taxable income. These differences are due to the recording requirements of GAAP for financial accounting (usually following the matching principle and allowing for accruals of revenue and expenses) and the requirements of the IRS’s tax regulations for tax accounting (which are more oriented to cash). Income statement: GAAP and IRS accounting can differ. Such timing differences between financial accounting and tax accounting create temporary differences. For example, rent or other revenue collected in advance, estimated expenses, and deferred tax liabilities and assets may create timing differences. Also, there are events, usually one time, which create “permanent differences,” such as GAAP, which recognizes as an expense an item that the IRS will not allow to be deducted. Noncash items, such as depreciation and amortization, will affect differences between the income statement and cash flow statement. Noncash items should be added back in when analyzing income statements to determine cash flow because they do not contribute to the inflow or outflow of cash like other gains and expenses eventually do. Depreciation refers to the decrease in value of assets and the allocation of the cost of assets to periods in which the assets are used–for tangible assets, such as machinery. obsolescence: The state of being obsolete—no longer in use; gone into disuse; disused or neglected. Noncash items that are reported on an income statement will cause differences between the income statement and cash flow statement. Common noncash items are related to the investing and financing of assets and liabilities, and depreciation and amortization. When analyzing income statements to determine the true cash flow of a business, these items should be added back in because they do not contribute to inflow or outflow of cash like other gains and expenses. Fixed assets, also known as a non- current asset or as property, plant, and equipment (PP&E), is an accounting term for assets and property. Unlike current assets such as cash accounts receivable, PP&E are not very liquid. PP&E are often considered fixed assets: they are expected to have relatively long life, and are not easily changed into another asset. These often receive a more favorable tax treatment than short-term assets in the form of depreciation allowances. 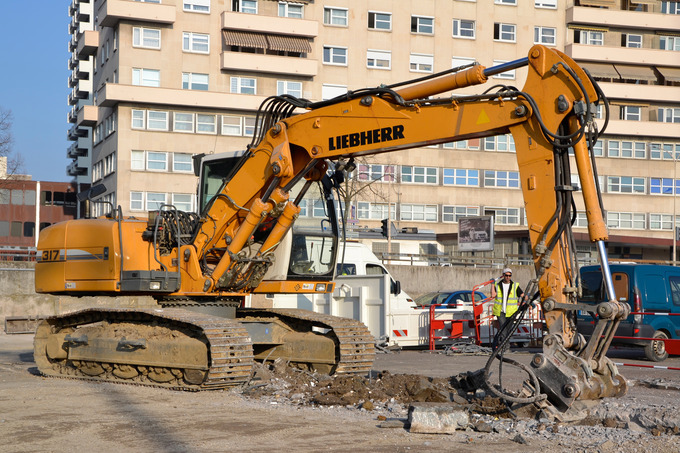 Machinery: Machinery is an example of a noncash asset. In each period, long-term noncash assets accrue a depreciation expense that appears on the income statement. Depreciation expense does not require a current outlay of cash, but the cost of acquiring assets does. For example, an asset worth $100,000 in year 1 may have a depreciation expense of $10,000, so it appears as an asset worth $90,000 in year 2.